Space – the final frontier. But in this case we’re talking the voyage of Mary Casio rather than Star Trek’s Captain James T. Kirk, boldly going where no woman has gone before – via a garden shed in Yorkshire. 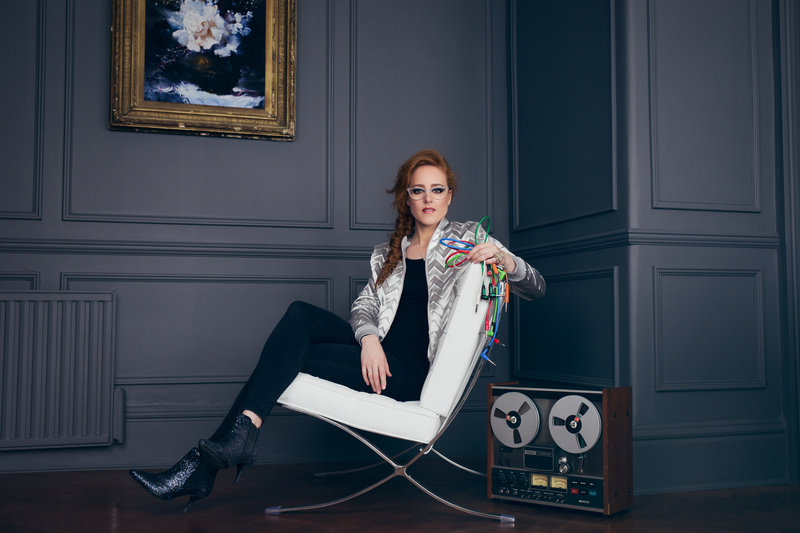 Last time I interviewed Hannah Peel for these pages, in November 2016, our conversation concentrated on acclaimed solo LP Awake But Always Dreaming and ongoing antics with esteemed sonic trio The Magnetic North in light of the Prospect of Skelmersdale album. But we also touched on a side-project she was involved with, and next week that rocket-boosted venture gets an independent launch. 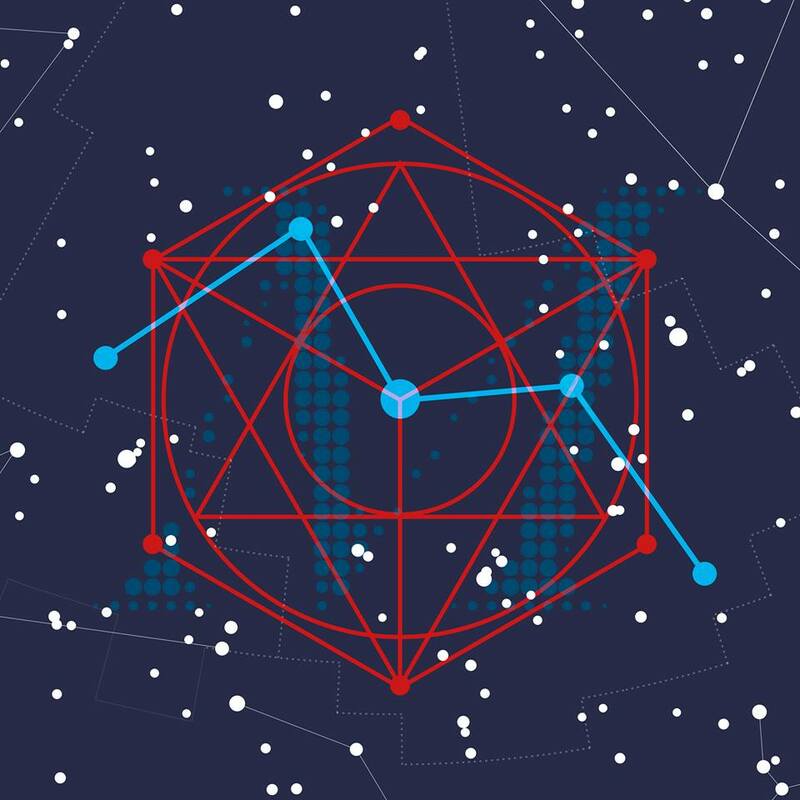 What’s more, Mary Casio: Journey to Cassiopeia – like the last offering released on her My Own Pleasure imprint – has already proved a critical and live success story. I guess the close relationship between popular music, classical music, astronomy and space travel has always been there. Take Gustav Holst or David Bowie for example, just two of the many stellar musical influences on Hannah. And carrying on where she left off on Awake But Always Dreaming – intrinsically linked to her trying to make sense through sound of her grandmother’s battle with dementia – I should let Ms Peel try and explain the concept behind her latest release, which takes on the notion that a character who loves watching the night sky – just like Hannah’s grandmother, she tells me – ends up making an end of life deep space odyssey in a bid to find that afore-mentioned final frontier. “I wanted to do something that wasn’t just songs and using my voice, and have this collection of keyboards and early synths, including Casio keyboards you can record your voice into. And just for fun sometimes I’d play people a song as this Mary Casio character. “Then I got approached to score for the Tubular Brass band. They were playing the second half of Mike Oldfield’s Tubular Bells live, and wanted a new composition for the opening half. I researched around then the constellation Cassiopeia, so thought Mary should go into space, on a journey, like my grandma and great-aunt, who never left Yorkshire but had always been stargazers. While she has strong links to Lancashire and Yorkshire, Northern Ireland-born Hannah is based in East London these days, a short commute away from her studio base near Hoxton Square. Yet her new LP’s launch sees her return to the city where she studied, another career highlight expected as she starts a Tubular Brass and Synths meets Mary Casio tour at Liverpool Philharmonic Hall on Saturday, September 23rd. Hannah started out playing fiddle in her father’s band, but had discovered a love of the trombone by the time her family relocated to the Barnsley area from Craigavon, playing in brass bands. Then at 18 she developed her violin, trombone, and piano skills at Paul McCartney’s Liverpool Institute of Performing Arts. Around then, she was also a regular at the nearby Phil, but never got to perform there … until now. There will also be something of a ‘homecoming’ in Barnsley the following month. What’s more, it’s at the Civic Theatre, where a 29-strong Tubular Brass and Synths ensemble recorded the Mary Casio LP. Hannah became involved with Tubular Brass after visiting Oldham and Saddleworth’s Whit Friday marches a couple of summers ago with support band, East India Youth, on a day off from touring. 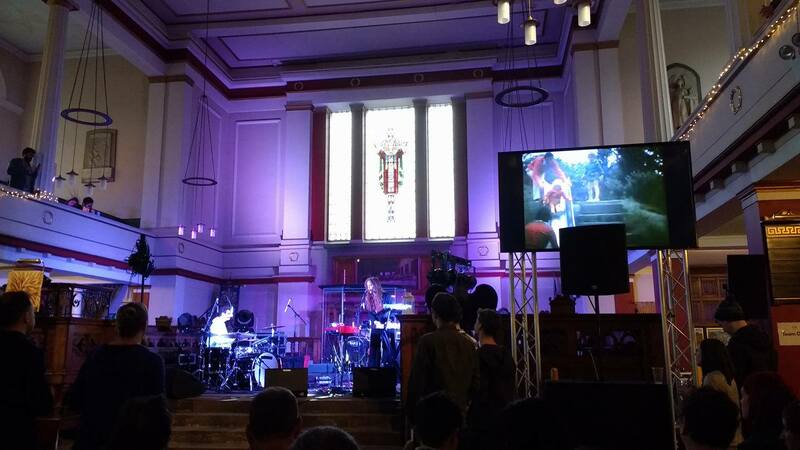 Having posted a photo from that event on Instagram, suggesting ‘brass bands meets electronica’, she was invited to write a piece of music combining the two, something she described as ‘a wonderful departure’, a chance to fuse her brass roots with the synth direction she’s taken since. And that commission allowed her to develop her alter-ego. 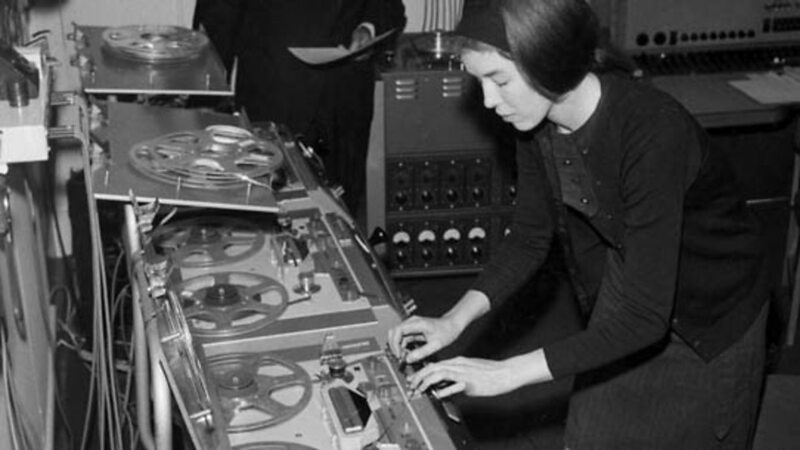 Those female pioneers of electronica, key innovators in the BBC Radiophonic Workshop sounds effect unit at Maida Vale, had long since resonated with Hannah, herself described as a modern-day Delia Derbyshire in some quarters. Having recorded a suite of pieces in her studio and written brass parts, Hannah got Sandy Smith’s Tubular Brass ensemble on board, a team from Peter Gabriel’s Real World Studios taking a mixing console to a theatre in Barnsley to capture a performance involving players drawn from various championship section bands around the UK. “That’s when the magic started to happen. As a trombone player it was about the power, richness and the unity of the breath. For me it was always the experience of the low, melancholy richness of the euphoniums, trombones and tubas. That was in my mind from the beginning, with the analogue synths and the way they breathe and have nuances. You hear where things go wrong, and when you switch something off sometimes it crackles. Hannah’s remained busy since her first break, work with Sandi Thom leading to backing and collaborations with and for the likes of The Unthanks, John Foxx and the Maths, and the Duke Special. She’d soon released ’80s covers EP, Rebox, and garnered interest from BBC 6 Music, going on to have 2011 solo debut LP The Broken Wave produced by Tunng’s Mike Lindsay, with strings arranged by Nitin Sawhney. 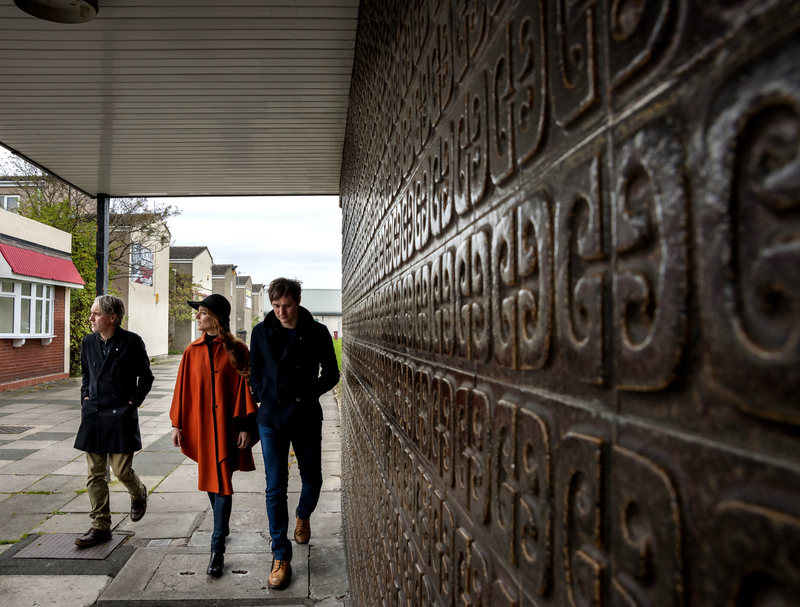 That led to interest from former Verve guitarist Simon Tong and writing partner Erland Cooper, working as The Magnetic North, inviting Hannah to join them on wondrous 2012 debut, Orkney: Symphony of The Magnetic North, adding string and brass arrangements. Erland (who also helped mix the Mary Casio album) went on to co-produce 2013 EP Nailhouse, while the following year’s Fabricstate EP included Royal Television Society award-winner Chloe, as featured in Channel 4 TV series Dates. 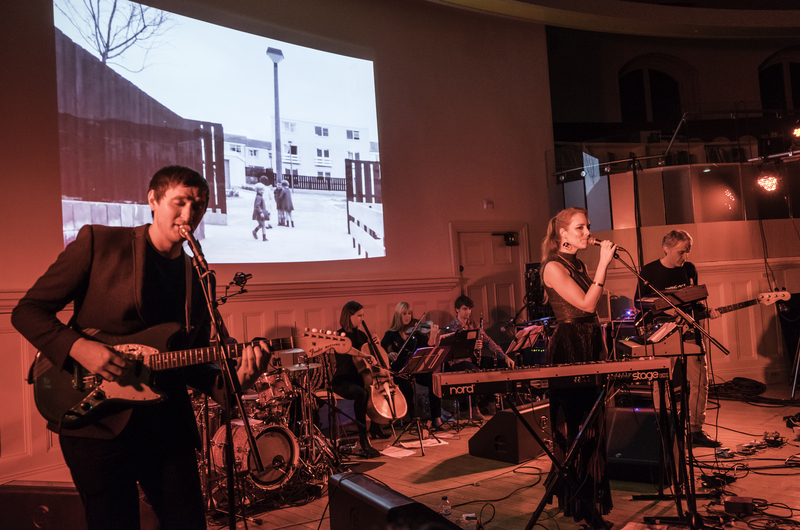 More critically-acclaimed works followed, The Magnetic North again on top form with 2016’s Prospect of Skelmersdale before Hannah’s revered solo album, Awake But Always Dreaming. And now we have Mary Casio on record, further industry and music media acclaim including support from radio presenters Cerys Matthews, of Catatonia fame, and Mary Anne Hobbs. We briefly mentioned Mary Casio last time we spoke, but I got the idea it was more a fun side-project. I’m guessing events overtook. There have already been several dates for Hannah with Sandy Smith’s brass ensemble, the most recent at St Cuthbert’s, Edinburgh, during the city’s world-renowned festival. Hannah has past form for playing church settings, not least seeing as last time I saw her was at St Philip’s, Salford, in early summer for Sounds From the Other City, overcoming a few early technical gremlins in the process. She’s being modest there, as suggested by the writewyattuk view on her performance here. 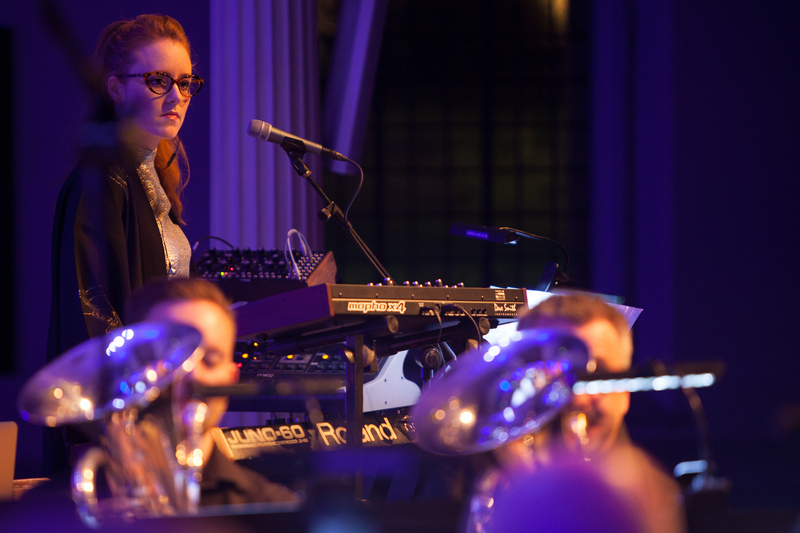 That was more about Awake But Always Dreaming, but since then Hannah’s concentrated largely on her Tubular Brass and Mary Casio sets, including dates at Cheshire’s Bluedot Festival and the European Capital of Culture, Hull. Is that how it’ll be at the Liverpool Phil and the other dates with the brass ensemble on this autumn tour? What was this multi-instrumentalist’s musical speciality as a student? She’s clearly making up for that now though. Does Hannah know all her bandmates’ names yet? Is it like being a teacher in a new school year? Can you get them to wear name badges maybe? 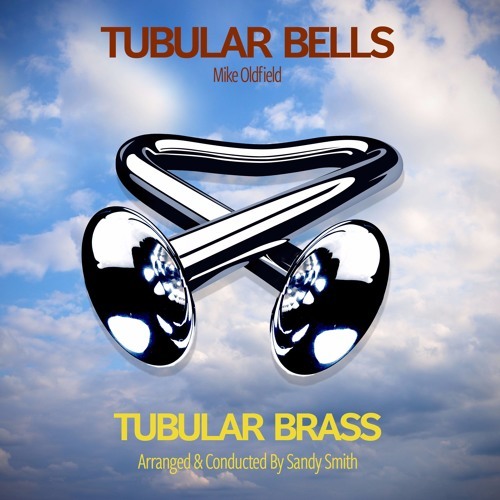 Concerning the Tubular Bells segment of the show, has Mike Oldfield got to hear about the show (and a tie-in album, released on Tubular Brass Recordings in June)? Back in July there was also a PRS Composers New Music Biennial Award for Mary Casio: Journey to Cassiopeia! in a collaboration with BBC Radio 3. Radio 3 – that’s a bit highbrow, isn’t it? I thought you were a pop star? But I guess the classical world’s all part of your musical background. It’s not always been about a love of ‘80s synth-pop. Last year I described Hannah’s debut with Mary (her middle name apparently) as ‘an artist transmogrifying as synth-based, space-age alter-ego, combining analogue electronics and a 33-piece colliery brass band to great effect, debuting to a sell-out Manchester audience’. And she told me then it was the most recent Magnetic North LP that gave her confidence to tap into childhood again. But looking at her CV, she’s been involved in film scoring and the like before. The first female recipient of the Arts Council of England’s Momentum Music Fund grant has also written scores for stage productions for London’s Sadler’s Wells Theatre, and contributed to the score of the movie Anna Karenina and TV series American Horror Story. It’s not just you playing with your vast collection of keyboards and early synths then? Let’s face it, you’re a bit of a geek on the quiet. Perhaps that’s the key to all this. Has stargazing had a hold on Hannah as well as her grandmother? On the sonic side of the project, I told Hannah I felt slightly out of my depth offering any classical critique. But I hear elements of Vangelis and maybe even Rick Wakeman-era Yes in there, and guess there’s nothing new in the link between science, astronomy and classical composition. Think of Stanley Kubrick’s use of Richard Strauss on the soundtrack for 2001: A Space Odyssey in 1968, for example. And there are hints of that on opening track, Goodbye Earth. There’s something else with an indirect link to cinematic sci-fi too, the brass on Sunrise through the Dusty Nebula taking me back to future Alien director Ridley Scott’s much-loved 1973 Hovis commercial, a young baker’s assistant struggling up Shaftesbury Hill, Dorset, as Dvorak’s New World Symphony plays. Am I right? There’s certainly an adventurous feel about the LP, one that works so well, and I don’t think it’s until track three, Deep Space Cluster, that Hannah puts a more recognisable personal stamp on it, adding a flavour of her past work – her signature synth, if you like – with The Magnetic North. Meanwhile, Andromeda M31 puts me in mind of Public Service Broadcasting’s The Race for Space. But what are we listening to in those disembodied voices? Are those radio signals in a foreign language? That use of at-hand technology fits nicely with Hannah’s trademark ethos and use of self-made music boxes for recording, while also championing those two female pioneers from the world of electronica she mentioned earlier. On next track, Life is on the Horizon, I suggest the brass again suggests Mary going through all manner of emotions and deep thought. I’m guessing there’s a bit of closure here after Awake But Always Dreaming, tackling again your personal experiences and feelings over your grandma’s battle with dementia. Archid Orange Dwarf is another lovely piece, and I can see why that was the track premiered on radio. And that leads nicely to wonderfully poignant, epic yet subtle finale, Planet of Passed Souls, and that Manchester Cathedral recording of her grandfather, the husband of the grandmother she paid tribute to. Ah, but that adds to it, surely. Finally, there’s the matter of the next album by The Magnetic North. The first was set in Orkney, on Erland’s home ground, while the second reflected Simon’s formative days in the Lancashire new town of Skelmersdale. So if I’ve got the format right, this time it’s a case of Erland and Simon visiting Hannah’s patch, her giving them an introduction then seeing what they come up with. Am I right? Are you worried you might not be invited back there when the record comes out? Last time we spoke you weren’t letting on whether the album theme would cover your Northern Irish or Yorkshire roots. For this site’s interview with Hannah Peel from November 2016, follow this link, and for April 2016’s interview with Simon Tong, head here. 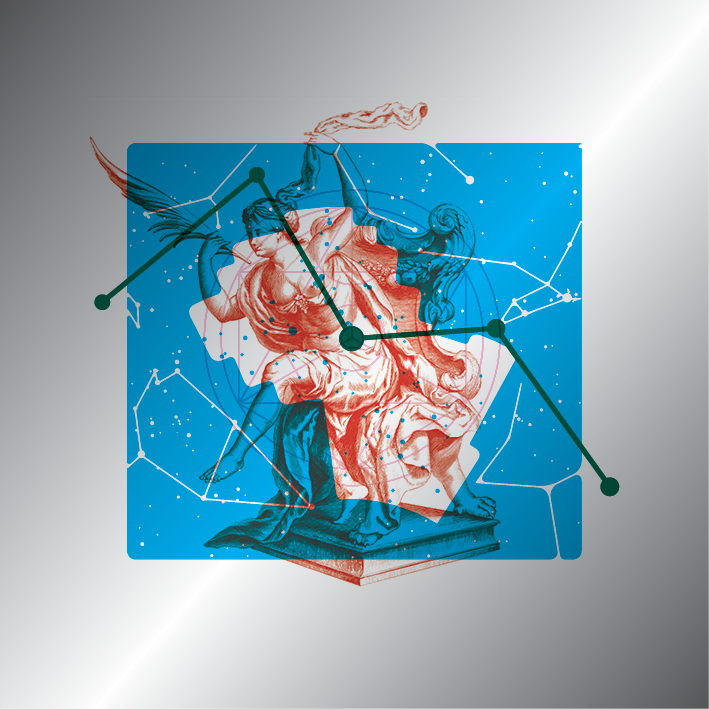 Mary Casio: Journey to Cassiopeia is out on Friday, September 22nd, in vinyl (500 metallic limited-edition LPs, designed by Barnbrook, also responsible for David Bowie’s Blackstar), CD and digital formats. For detail head here. You can catch Hannah Peel’s Mary Casio: Journey to Cassiopeia tour at Liverpool’s Philharmonic Hall on Saturday, September 23rd; Stockton-on-Tees’ The Arc on Saturday, September 30th; Barnsley’s Civic Theatre on Saturday, October 21st; and Basingstoke’s Anvil Arts on Saturday, October 28th, all four shows also featuring Tubular Brass and Synths playing Mike Oldfield’s Tubular Bells. More solo shows are planned at Sheffield’s Sensoria Music/Film/Digital Festival on Saturday, October 7th, and Bury’s Enlighten Bury Festival of Sound and Light on Friday, October 20th. For ticket details of all six, try this link. The Tubular Brass project involves players drawn from elite brass band and orchestral fields, led by Sandy Smith, its ensemble performing contemporary and classic prog rock, working with artists from across the musical spectrum, aiming to bring brass music to a new audience through unique projects and collaborations. For more information, try here. 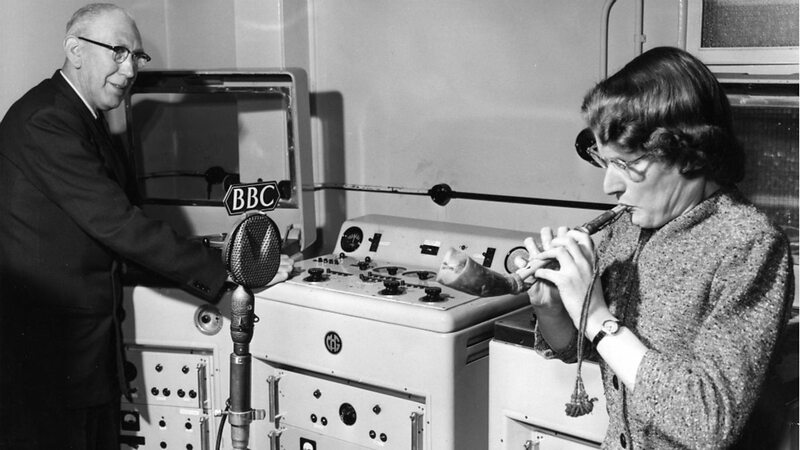 The BBC Radiophonic Workshop shots used above are from an excellent photographic piece on the Maida Vale unit from March 2016, linked here. This entry was posted in Books Films, TV & Radio, Music and tagged 2001: A Space Odyssey, Anna Karenina, Barnsley, brass bands, Cassiopeia, Craigavon, Daphne Oram, Delia Derbyshire, Dobcross, electronica, Hannah Peel, Liverpool, Liverpool Institute of Performing Arts, Liverpool Philharmonic, Mary Casio, Public Service Broadcasting, The Magnetic North, Tubular Bells, Tubular Brass. Bookmark the permalink.